I prefer to use nonhydrogenated vegetable shortening in these cookies; it is packaged in sticks like butter, and found in the refrigerated section in most natural foods stores and supermarkets. 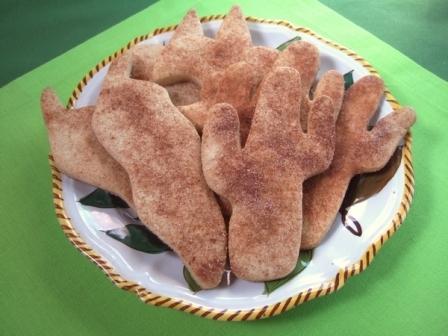 Biscochitos are traditionally cut in a diamond shape (for weddings) or a Fleur De Lis shape, but the cactus and chili pepper shapes are fun for Cinco de Mayo. Mix just until all ingredients are well blended; do not overmix. Chill dough for 3 to 4 hours before rolling. Preheat oven to 350 degrees. Roll dough out on a lightly floured counter to 1/4 inch thickness and cut with your favorite Ann Clark cookie cutters, then transfer cookies onto cookie sheets that have been lined with parchment paper or silicone liners. Using a pastry brush, brush each cookie lightly with water, then sprinkle with the cinnamon sugar mixture. Bake 10 to 12 minutes, until lightly colored. Let cookies cool slightly on cookie sheets, then transfer to a wire rack to cool completely.